You’ll feel like king or queen of the mountain when you arrive at A Splashtastic View. 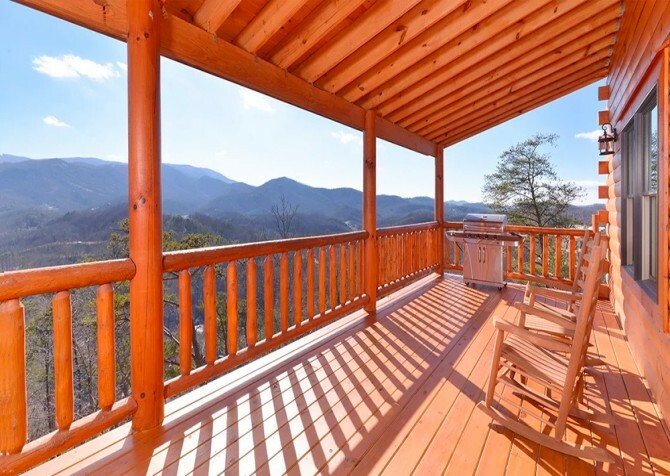 This secluded Pigeon Forge cabin sits at the top of a somewhat steep (though paved) driveway, offering impressive views of the Smoky Mountains from nearly every angle. 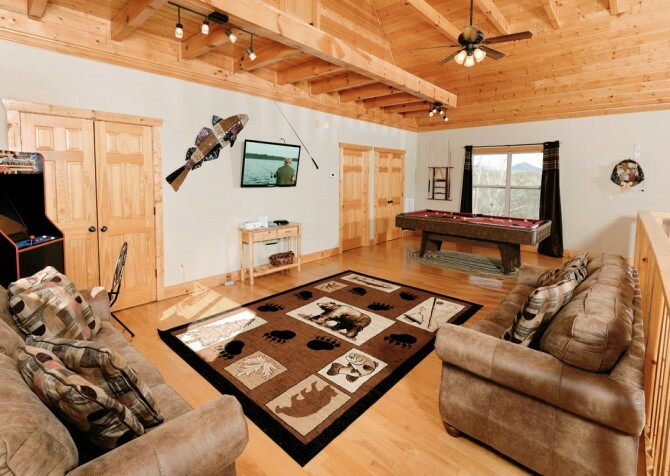 That means there’s no need to ride the Aerial Tramway to see the mountains when you stay at A Splashtastic View, and this cabin provides enough space—with 4 bedrooms and 3 full bathrooms—for a group of up to 14 guests to enjoy these views. With plenty of options for entertainment and relaxation, A Splashtastic View boasts a pool table, private indoor pool, arcade games and game system, and the list goes on! 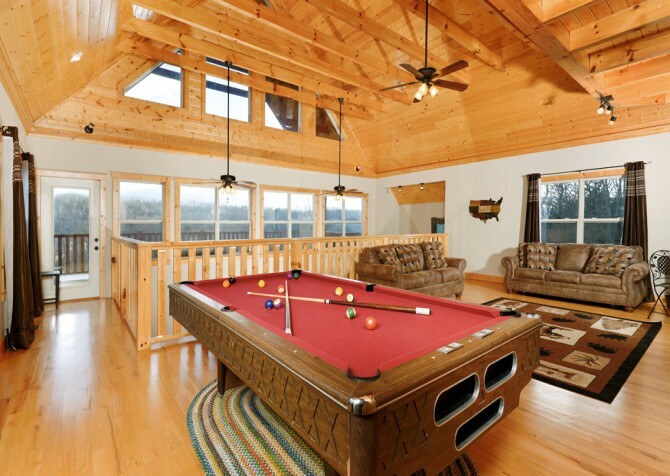 Kids and adults will love this fun cabin that's also impressive outside. 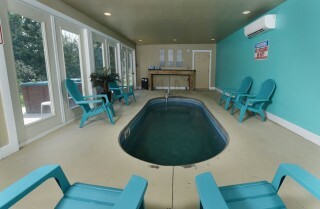 Sit around the fire pit for s'mores at the end of the day or climb into the soothing hot tub to unwind! This private mountain cabin offers everything you need for a great time and comfortable stay in the Smokies – without even leaving the cabin! 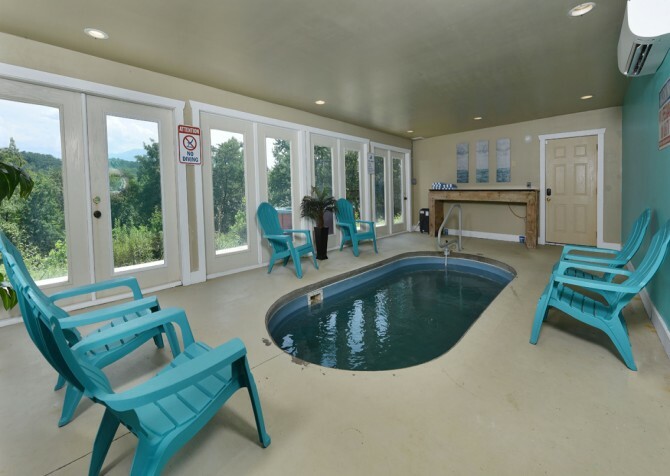 Hardwood floors, recessed lighting, and an open-concept floorplan make A Splashtastic View your modern oasis in the mountains. 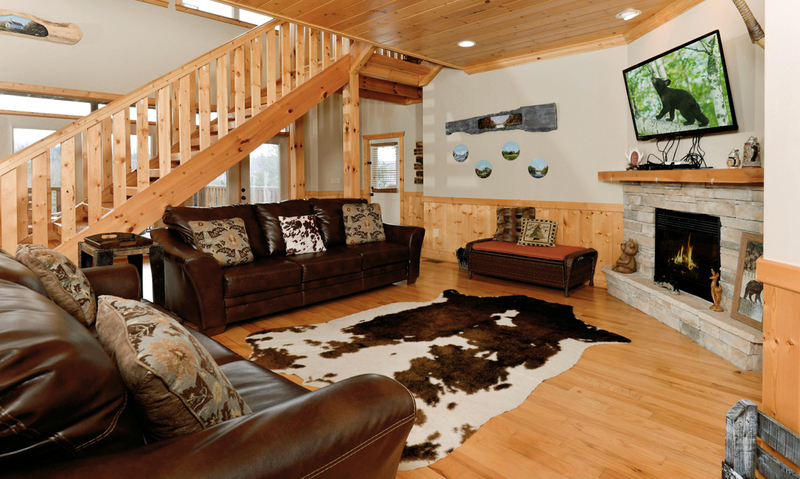 The living room of this cabin features 2 full-size leather couches, a coordinating bench that can double as a table for games or snacks, and an end table for your convenience during your stay. 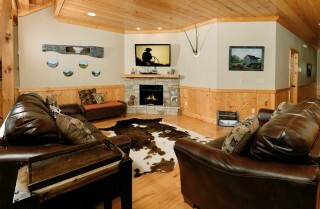 You’ll also enjoy a mounted flatscreen TV above the stoneset fireplace (electric) in this space. 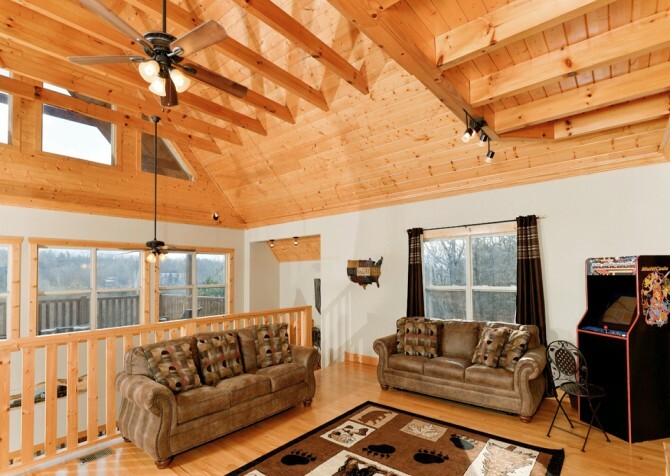 Make the living room of this cabin your perfect place to crash after horseback riding through the woods or spending the day at The Island in Pigeon Forge. You can watch a favorite movie, play a board game, or just swap your favorite memories of the day while relaxing in front of the fire. The kitchen in A Splashtastic View continues the modern updates found throughout this Pigeon Forge cabin. Beautiful granite countertops provide the perfect place to prep and serve homemade meals for your group. The recessed lighting, stained cabinets, and tile backsplash also provide an updated feel as you maneuver through this large kitchen. Take advantage of all your major appliances in black as well as silverware, utensils, cookware, and serving pieces during your stay. 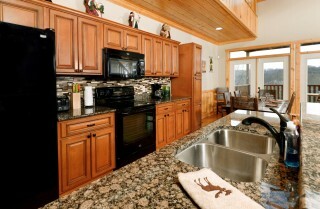 And there should be plenty of counter space for more than one cook to help prepare easy meals for your group. 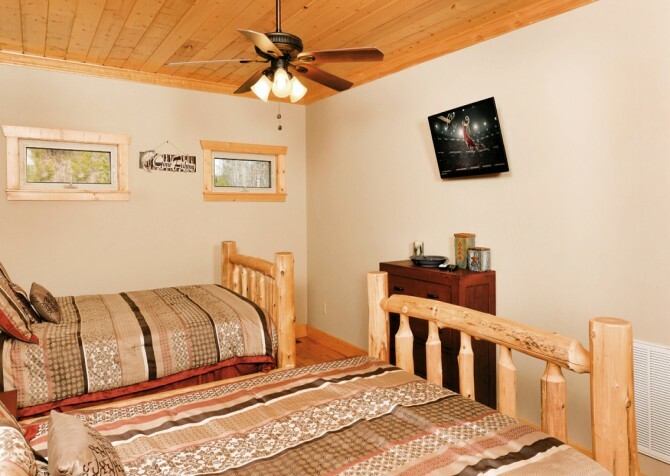 You can save money by setting up a taco bar or grilling on the gas grill provided with this cabin. 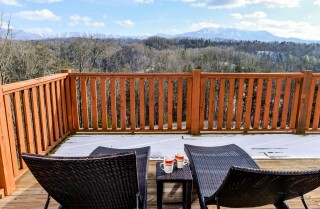 For breakfast, simply set out some cereal and toaster pastries for a quick grab-and-go meal before heading out for exciting Pigeon Forge adventures during the day. Or you can order our Mountain Breakfast basket that’s loaded with breakfast staples like muffins, fruit, orange juice, milk, pancake mix, bacon, and eggs. 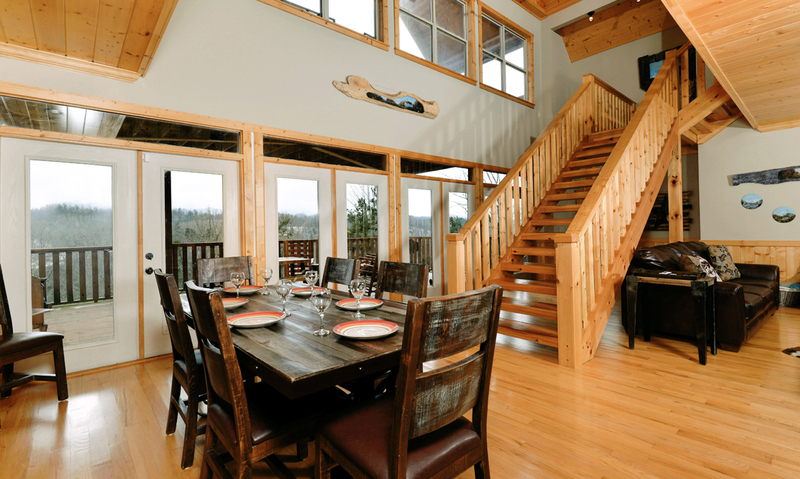 The dining room of A Splashtastic View is located on the same floor as the kitchen and living room. This is the perfect place to enjoy meals with your group. 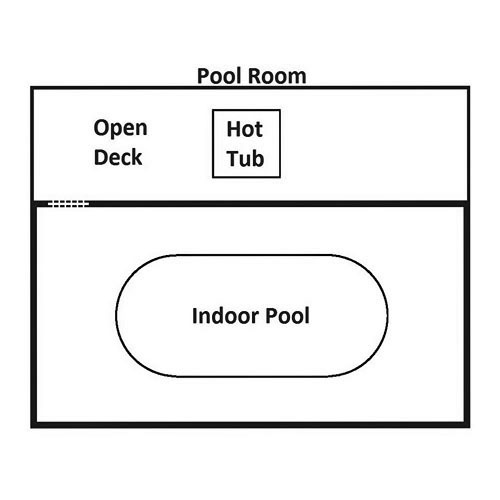 You’ll have access to a rectangular wooden table with place settings for 6. 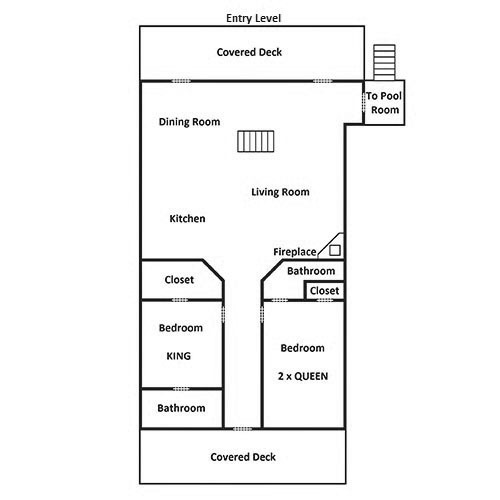 For extra guests, either pull up an additional chair to the table or spread out on the couches in the living room. 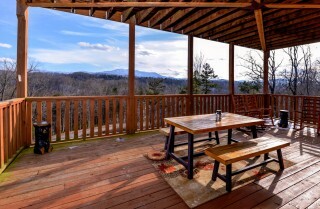 You should find plenty of space on the main floor of A Splashtastic View for all your guests during mealtime. 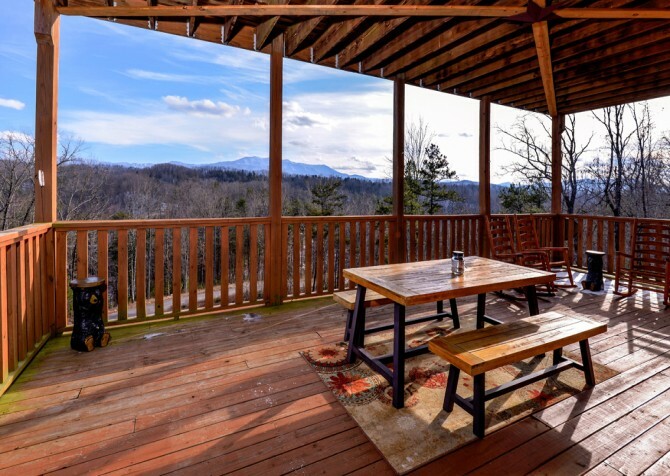 And the best part about eating in the cabin—besides saving your group money—will be the fantastic mountain views surrounding this dining space. Large floor-to-ceiling windows line the back wall of the cabin for a dining experience unlike any other! Upstairs in A Splashtastic View is an alternative hangout space that offers comfortable seating and plenty of ways to entertain. 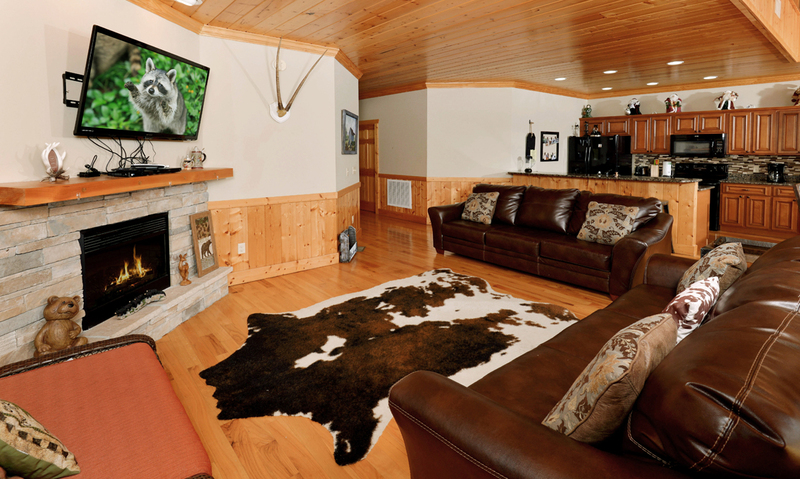 Enjoy 2 cozy couches in the rec room of this cabin as well as an additional flatscreen TV. 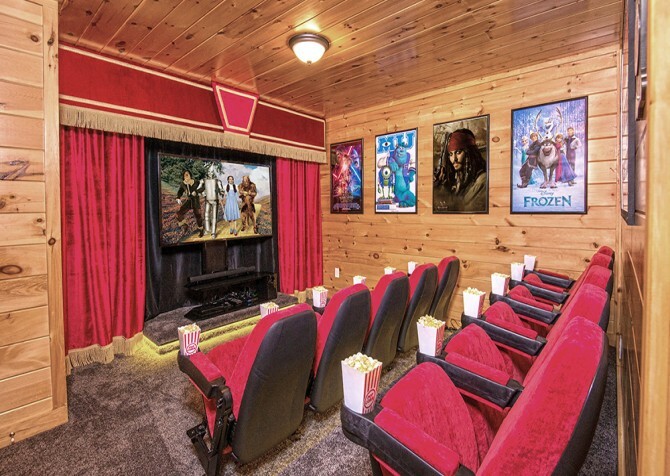 This spot is perfect for kids who want to watch a different show or movie than their parents or for guys who want to catch the game while the girls chat downstairs. Also in the rec room are a pool table and an arcade machine for rainy-day fun or just some affordable alternatives to driving to downtown Pigeon Forge. The rec room is large, airy, and full of space for kids and adults of all ages. 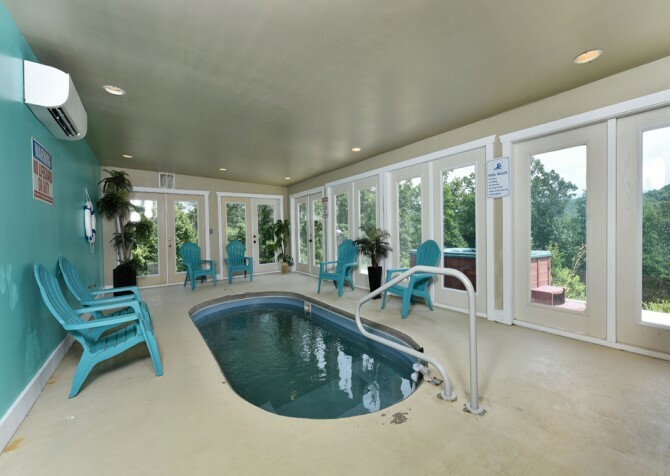 When you’re looking for a fun way to relax or a place to play with the kids while you’re in Pigeon Forge, you won’t have to look very far inside A Splashtastic View to find what you’re seeking. Besides the game tables in the rec room, this cabin also provides an indoor private pool for some recreational fun in the Smokies. 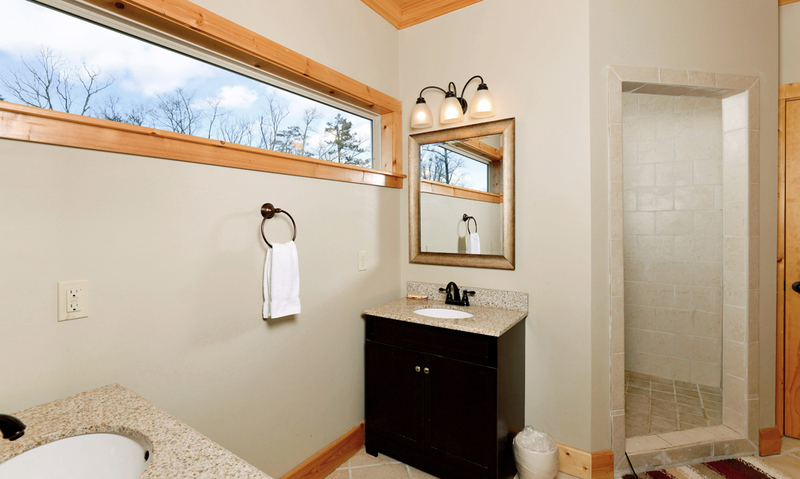 With large windows all around, you can enjoy mountain views while you splash around with family and friends during your stay. A Splashtastic View offers sleeping space for up to 14 guests with its 4 bedrooms and 3 full-size bathrooms found in the cabin. 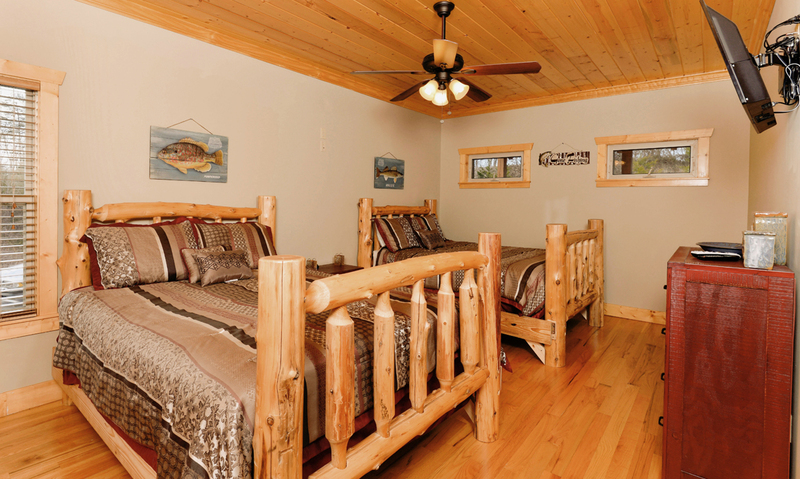 Two of the bedrooms come with king-size beds, one bedroom has 2 queen-size beds for groups of friends or single adults and one bedroom has a set of twin bunk beds. 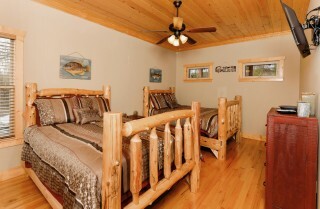 You’ll also find 2 sleepers in this cabin to accommodate additional guests. The bedrooms are beautifully decorated with a modern twist on traditional Smoky Mountain décor. You’ll find everything from log-style furniture to granite countertops in these bedrooms and bathrooms. For your convenience, the bedrooms offer homey accessories like ceiling fans, bureaus, TVs, nightstands, and reading lamps. And to add a little luxury to your stay, enjoy some downtime in this cabin’s indoor jetted tub! Step onto the back porch of A Splashtastic View and you’ll be wowed by the panoramic vista all around you. In the distance are the beautiful Smoky Mountains, which you can enjoy whether you visit this cabin in the peak of summer or the middle of winter. 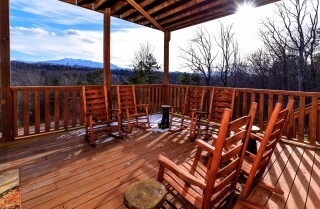 Savor these views from multiple sitting areas on the porches of this cabin. 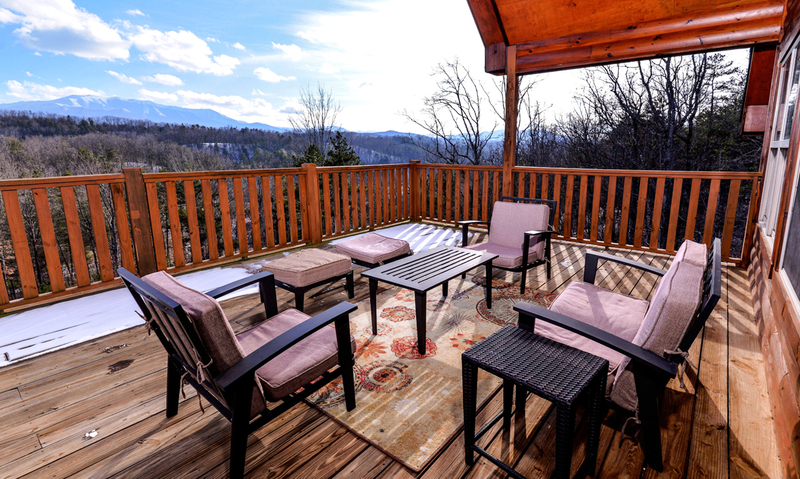 Lounge chairs, a plush patio set, a collection of rocking chairs with end tables, and a picnic table on a covered deck are all available for your guests to use during your stay. You can also grill out with the gas grill or even head around to the side of the cabin for an evening bonfire with your group. The fire pit and all the other outdoor accessories that come with A Splashtastic View make for endless outdoor possibilities during your Pigeon Forge stay! 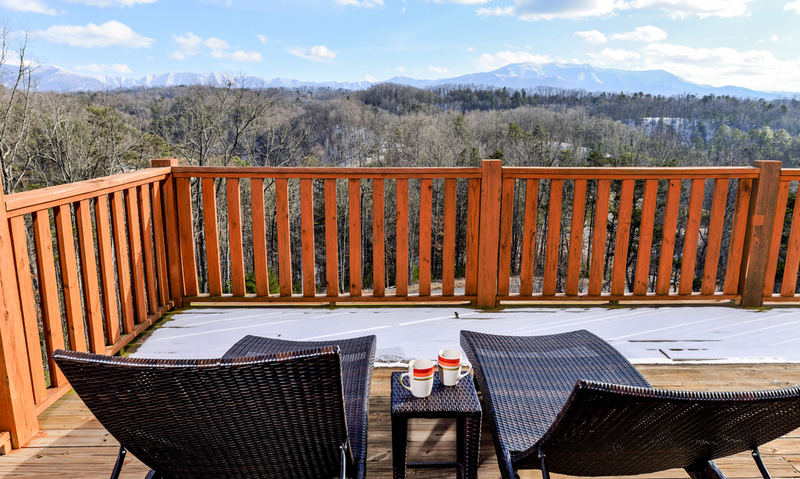 A Splashtastic View offers everything you need to stay comfortable and have a great time while you’re in the Smokies. 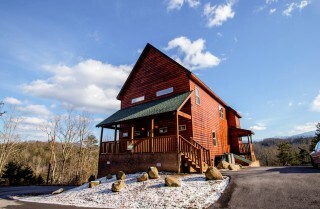 Along with the amenities already listed, other entertaining options found inside this cabin include high-speed Wi-Fi, a Wii with games, a Blu-ray player, and a DVD player. 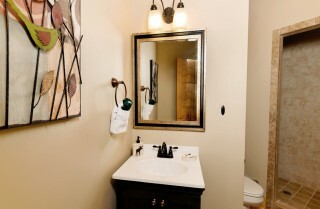 For your convenience, you’ll also have access to a washer and dryer during your stay. 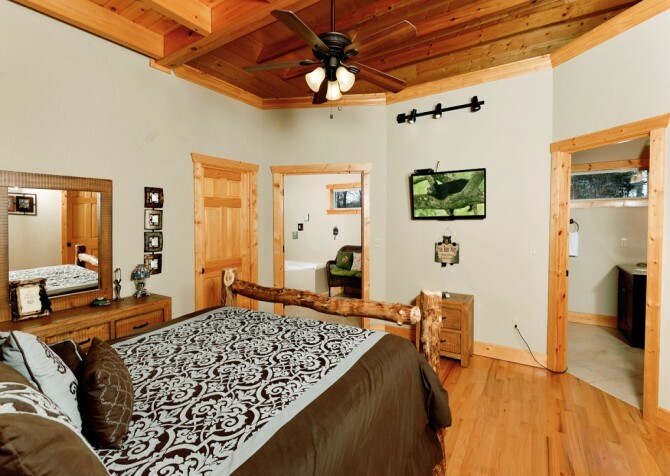 Plan for this cabin to be your home away from home while you’re in the Smokies. 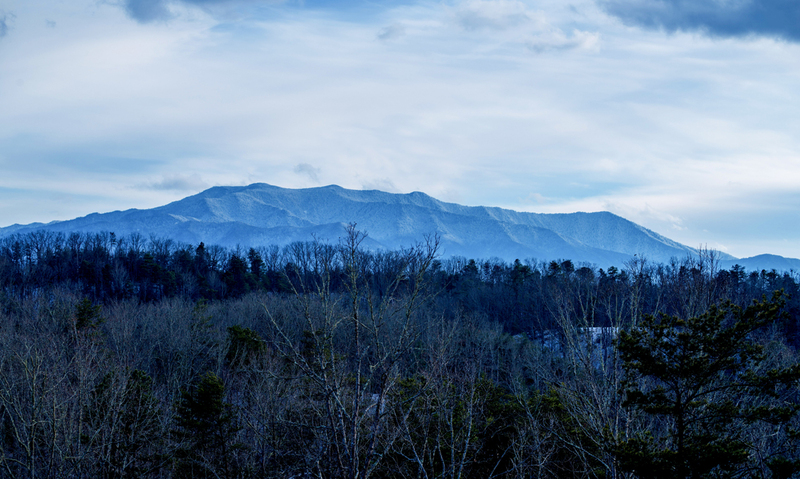 For kids, adults, and everyone in between, Dollywood has something to thrill you, entertain you, and excite you during your Pigeon Forge stay. 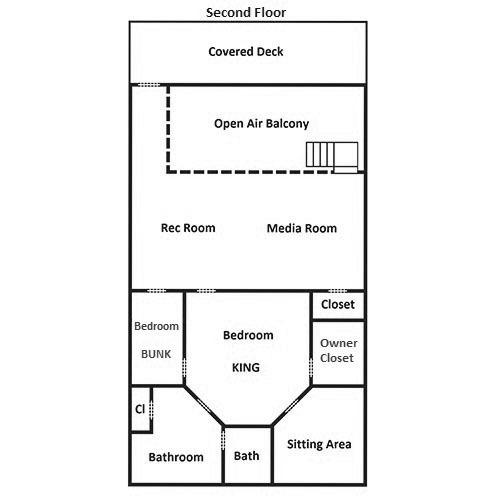 Roller coasters, water rides, and live shows are just a few things this popular amusement park has in store. Go karts aren’t just entertaining for kids, especially when you visit NASCAR SpeedPark in Pigeon Forge. Even groups of adults will love riding around the 8 go-kart tracks found at this exciting attraction. 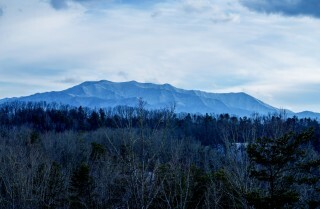 Located in nearby Gatlinburg, this all-inclusive attraction has unique shops, exciting rides, delicious restaurants, and more. A turn on the Alpine Slide, a lap around the ice skating rink, or a visit to the Wildlife Encounter are some of the fun things you’re invited to check out at Ober Gatlinburg. "This was a great cabin. 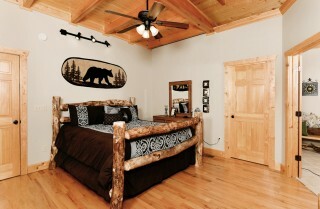 Everything was just perfect for our family. Cabins 4 U also gave us a great starter kit and a keepsake bag. This cabin has lots of room and the indoor pool was perfect for the "littles." I can't wait to…"
"This was a great cabin. 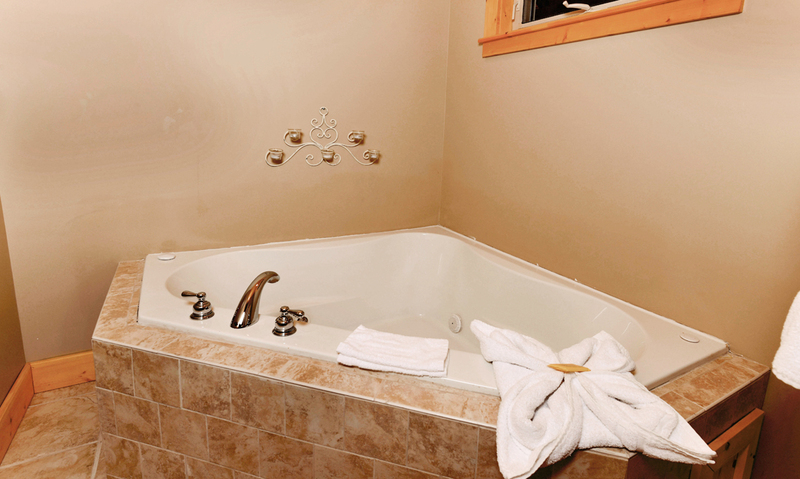 Everything was just perfect for our family. 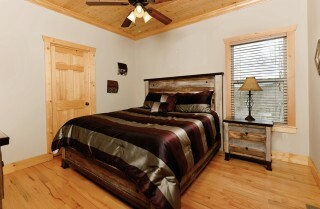 Cabins 4 U also gave us a great starter kit and a keepsake bag. 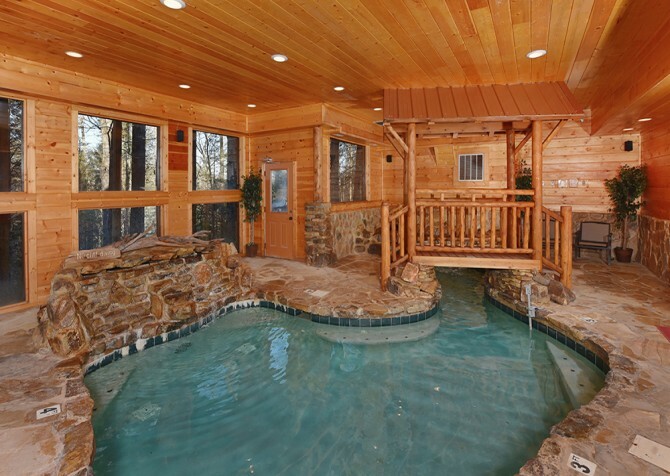 This cabin has lots of room and the indoor pool was perfect for the "littles." I can't wait to rent from Cabins 4 U again. Check-in and Check-out was soooo easy. 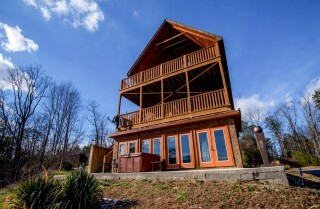 Thank you for a great vacation! 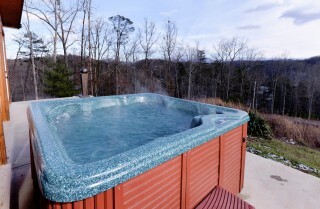 Can't wait to do it again. : )"
Thank you so much for this wonderful review! We are so glad to hear that you enjoyed the starter kit and keepsake bag! We can not wait to have you stay with us again in the future! 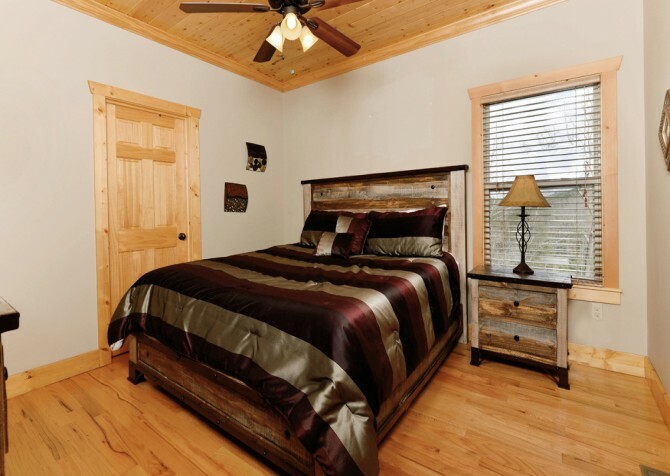 "My family and I stayed in A Splashtastic View last weekend it was beautiful even after seeing the pictures it was nice, clean and very spacious...when we visit again we will be booking with Cabins For You again!! 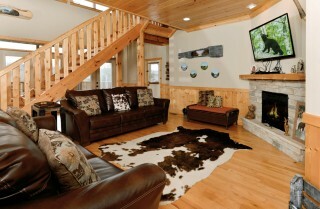 !Thanks so much"
"Cabins For YOU was above amazing on everything. 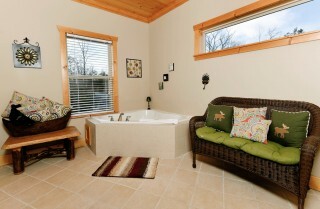 I will never not book a cabin through anywhere else but them. 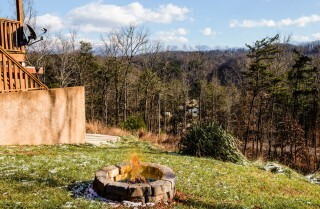 Had such an incredible weekend."